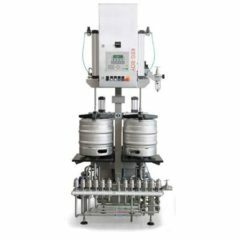 The KRF-21 is a multifunction machine that includes a device for rinsing of stainless steel kegs with- one position for a keg. 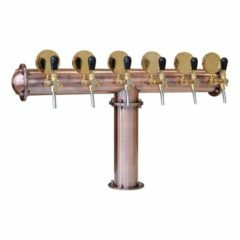 The equipment is designed for the rinsing of kegs for beer, cider, wine and for other beverages, using semi-automatically operated valves and a pump. 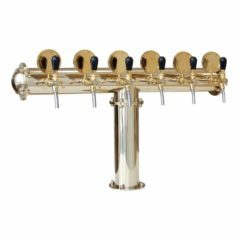 Operating capacity : from twelve up to twenty kegs per hour (rinsing and sanitizing). 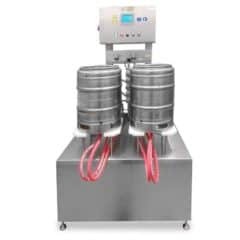 The KCA-20D is a multifunction machine that includes a device for automatic rinsing of stainless steel kegs and the automatic isobaric filling of carbonizated beverages like beer, limonade wine or cider, into kegs. 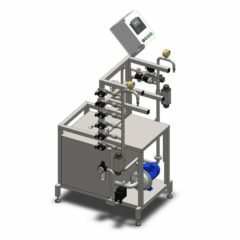 The equipment is designed for the filling and rinsing of kegs with beer, cider, wine and for other beverages, using by computer control operated valves and a pump. 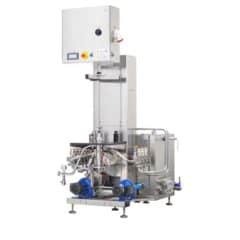 In comparation with the KCA-25 machine the KCA-20D machine includes two tanks and two pumps to sanitation of kegs using both alcalic and acid sanitizing solutions. 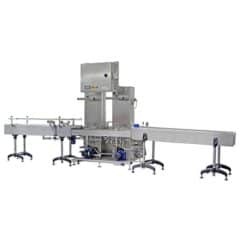 Operating capacity : from eight to twenty kegs per hour (all rinsing, sanitizing cycles and the filling cycle / only rinsing and sanitizing cycles). Two cycles : the rinsing cycle & the sanitation cycle : the maximal performance 20 kegs per hour ( with volume of 50 liters). Three cycles : the rinsing cycle & the sanitation cycle & the filling cycle : the maximal performance 8 kegs per hour ( with volume of 50 liters). 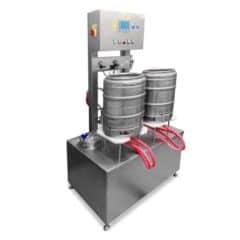 The KRF-42 is a multifunction machine that includes a device for rinsing of stainless steel kegs with- two positions for kegs. 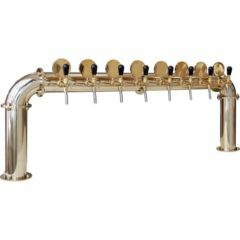 The equipment is designed for the rinsing of kegs for beer, cider, wine and for other beverages, using semi-automatically operated valves and a pump. Operating capacity : from twenty five up to fourty kegs per hour (rinsing). 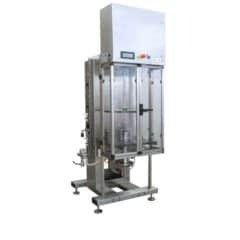 The KCA-50 is a multifunction machine that includes a device for automatic rinsing of stainless steel kegs and the automatic isobaric filling of carbonizated beverages like beer, limonade wine or cider, into kegs. 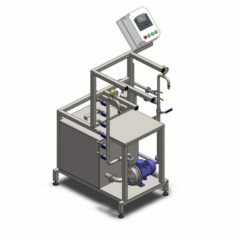 The equipment is designed for the filling and rinsing of kegs with beer, cider, wine and for other beverages, using by computer control operated valves and a pump. Every machine of both is equipped with only one tank for storage, heating and dosing of the alcalic sanitizing solution during the CIP cycle. 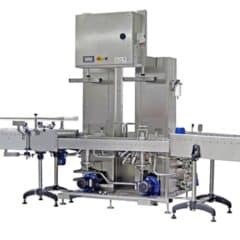 Operating capacity : from twenty to fifty kegs per hour (all rinsing, sanitizing cycles and the filling cycle / only rinsing and sanitizing cycles). 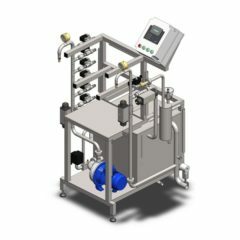 Two cycles : the rinsing cycle & the sanitation cycle : the maximal performance 50 kegs per hour ( with volume of 50 liters). 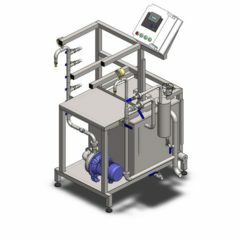 Three cycles : the rinsing cycle & the sanitation cycle & the filling cycle : the maximal performance 20 kegs per hour ( with volume of 50 liters). 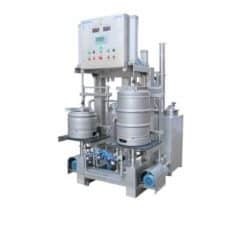 Two positions for paralel cleaning, sanitizing and filling of steel kegs. 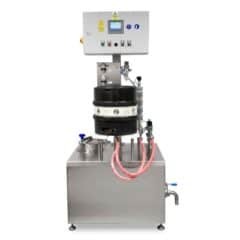 The KCA-40D is a multifunction machine that includes a device for automatic rinsing of stainless steel kegs and the automatic isobaric filling of carbonizated beverages like beer, limonade wine or cider, into kegs. 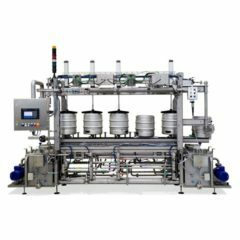 The equipment is designed for the filling and rinsing of kegs with beer, cider, wine and for other beverages, using by computer control operated valves and a pump. 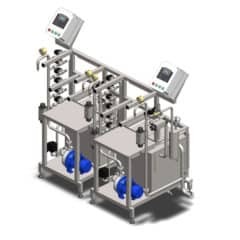 In comparation with the KCA-50 machine the KCA-40D machine includes two tanks and two pumps to sanitation of kegs using both alcalic and acid sanitizing solutions (two tanks on each machine = total is four tanks). Operating capacity : from sixteen to forty kegs per hour (all rinsing, sanitizing cycles and the filling cycle / only rinsing and sanitizing cycles). Two cycles : the rinsing cycle & the sanitation cycle : the maximal performance 40 kegs per hour ( with volume of 50 liters). 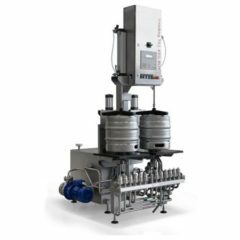 Three cycles : the rinsing cycle & the sanitation cycle & the filling cycle : the maximal performance 16 kegs per hour ( with volume of 50 liters). 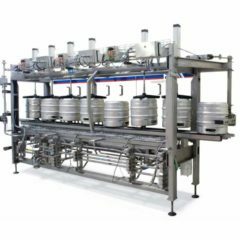 The KWF-19 is an equipment used for automatic rinsing and filling of kegs designed for beer, cider, wine and for other beverages. 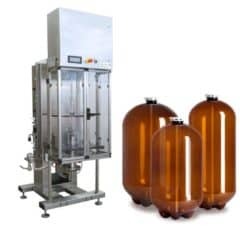 Operating capacity: kegs : 16 – 19 per hour (50L / 20 or 30 L).